Have you checked out my 16 Spring Fashion Must Haves yet? This is probably my favorite outfit of the week, and it is what I wore to work yesterday. I fell in love with this Kimono in American Eagle as soon as I walked into the store, and it is probably the only single item I bought this spring that was not on sale. But good news for you if you like it too! It is on sale right now, and there is a link to it in the picture above. I bought the striped shirt to wear with it, but could also wear several other things with it. Since I work in a middle school, I try to be conservative, and I wore this to work, but I would probably put a tank or something under it otherwise. We are going to Las Vegas next weekend, and I will probably pack this to wear in a completely different way. I bought this striped T shirt with leather pocket at a thrift store recently for like $2! I was like, who would even want to get rid of this? It’s totally in right now! But oh well, my gain! And, funny story about the camouflage jacket I am wearing with this outfit, I happened across it at Old Navy last week and it was on clearance for $14.99. Unfortunately on the website the price is $39.99, so that is weird that I got it for $14.99 in the store. But there was just one little detail, it was in the men’s department. Did that stop me from buying it, um no! I just went down a size and scooped it up! I have no problem with buying something in the men’s department if I like it and it fits. Not much new in this outfit, except for the denim vest. Everything else I have owned for a while. I do love this striped peplum shirt that I bought last summer at Marshall’s. We went to a Baseball game at West Virginia University on Friday of last week, and this is what I wore. I actually designed this T shirt that has the WV shape on it and it says “home”. I ordered it off of a website called Hicustom, but for some reason when I try to visit the website it is giving me a message that says forbidden. If I end up being able to access the website I will put the link in. This is what I wore to work on Monday. I kind of love this striped tank and wish I had it in every color of the rainbow, adn bonus, it is now on sale for $6.99! I love the fit of it, so comfy! It is currently on clearance at Gap, and it comes in a grey and white stripe too. 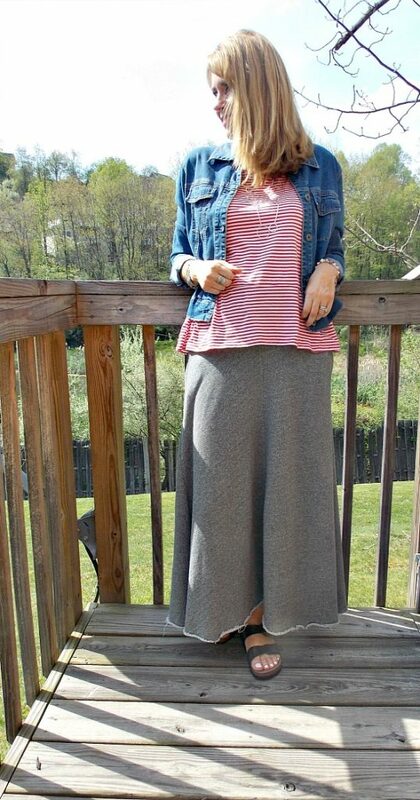 I bought this maxi skirt a few years ago, and it is one of my most favorite skirts, It is made out of sweat pant material. You can’t get much more comfortable than that!